Monument Living at it's finest! This impeccable ranch-style home offers one level living in private, 1 acre setting w/ majestic mountain views! Gas cooking, double ovens, kitchen island, granite counters, pantry, hardwood floors, soaring ceilings, large great room w/ fireplace, formal and informal dining, beautiful master suite w/ fireplace, walk out to deck, spa shower, soaking tub, and large walk in closet. Finished walk-out basement offers large rec-room w/ fireplace and 3 additional bedrooms w/ Jack and Jill bath, powder room, and second laundry. High-end custom blinds and plantation shutters throughout. Woodmoor Public Safety provides 24/7 security w/ rapid response to resident calls and contributes to Woodmoor's very low crime rate. "The Barn" Community Center offers residents a venue for all types of functions from parties to seminars. 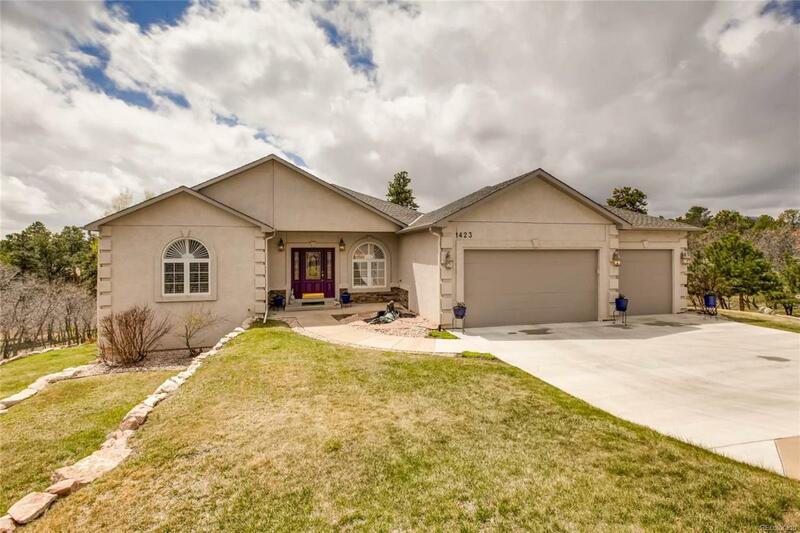 Excellent location close to I25, shopping and award winning D38 schools. 25 minutes to both Colorado Springs (South) and Castle Rock (North).